Yet Trout and Harper remain inextricably linked in the minds of many (including this scribe) in part because on the day that Harper debuted in the majors (April 29, 2012), Trout returned from Triple-A for good, and both players took their respective leagues by storm en route to Rookie of the Year awards. Though separated by about 14 months in age, they’re part of a baseball cohort in a way that Trout and Paul Goldschmidt or Giancarlo Stanton (whose totals of plate appearances are all in the same vicinity), or Harper and Machado (whose free agencies coincided) are not. The relatively stoic Trout and the more demonstrative Harper pair well as contrasts, too. Trout is so routinely great without calling attention to himself that he sometimes recedes into the background, to the point of being forgotten, while Harper’s combination of hot streaks and exuberance is more eye-catching — in grabbing our attention, he also reminds us that hey, that other guy is playing even better. The dynamic duo are currently scalding the ball, in case you haven’t noticed. Harper, who signed a record-setting 13-year, $330 million contract, is off to a flying start with the Phillies (.314/.500/.743, four home runs, and a 198 wRC+ through Wednesday). 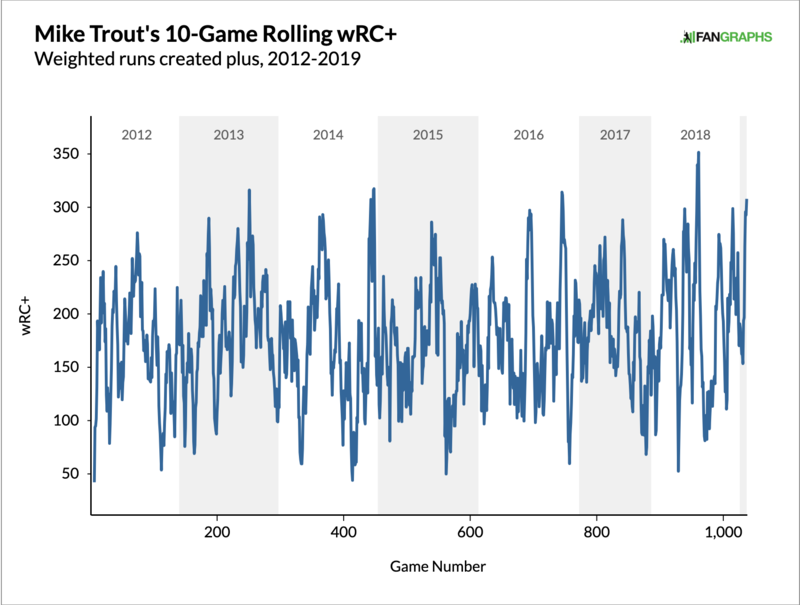 Trout, who signed a record-setting $12-year, $430 million extension less than three weeks after Harper inked his deal, is flying even higher (.406/.592/.938, five home runs, and a 288 wRC+). Using that page’s “Export Data” function, I calculated the pair’s combined wRC+ for every date on which they both played and had the requisite 10 games in the sample (we’re not yet to 15 games for either player in 2019, hence this choice). That means that if one player was on the disabled list, or even had an off day, there’s no data point for that day. On the other hand, each player’s 10-game range might have different dates attached due to such absences. As it turns out, April 9 — the point at which Harper reached 10 games this year (Trout had done so two days earlier), and the last point for which we have data, because Trout hasn’t played since then due to a groin strain that we’re all praying is minor — is the end of the seventh-best such stretch. Trout’s videogame-like numbers you saw above; Harper was hitting .333/.511/.788 for a 210 wRC+ before taking an 0-for-3 and an early exit from Wednesday night’s 15-1 drubbing by the Nationals. The heavyweight championship belongs to a stretch in late April 2017 during which Harper hit .588/.674/1.206 with five homers, with Trout at .375/.432/.725 and three homers. One aspect of this that’s particularly striking is that we have to dig down to the 19th spot to find a combined performance that lands in an even-numbered year. Harper hit for a career-low 111 wRC+ in that 2016 season, four points lower than in 2014 and nine points lower than in 2012. For some weird reason, he’s simply been better in odd-numbered years, like two-time Cy Young winner Bret Saberhagen. From a contemporary standpoint, that’s more satisfying, as this season’s opening salvo climbs to fifth (not third, as I originally had it when this published — score that E6). Streaks from every season except 2014 and ’18 are represented, with the 2015 season, Harper’s MVP year, dominating the charts, as separate streaks from May, June, July, and September all rank among the top six. 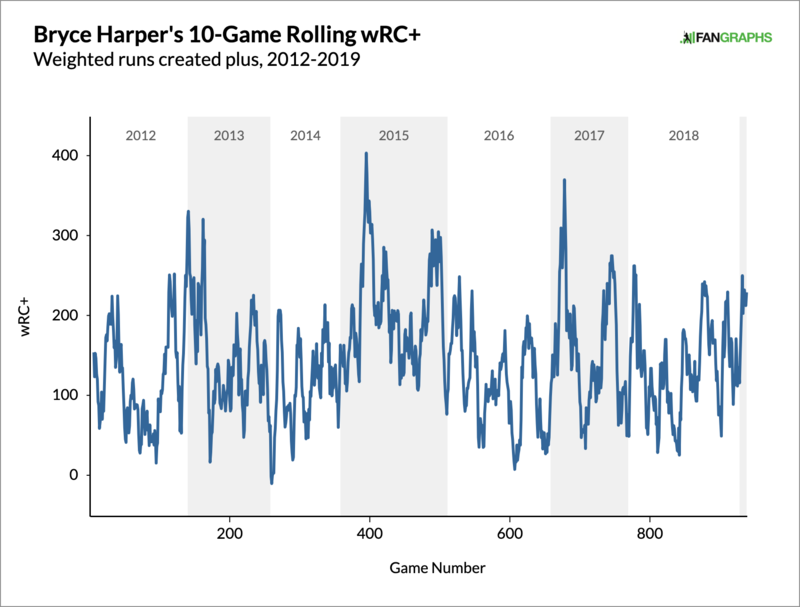 Harper pulls his weight here, owning the higher wRC+ of the pair (highlighted with the bold-faced numbers) in five of the streaks . Above we’ve got almost entirely even-year streaks, with one exception apiece from 2013 and ’15. Every season but 2017 and this one is represented, with 2016 the most common one. During the very worst stretch, in September 2016 — a rare instance of both players falling well below 100 — Harper hit .094/.310/.188, with a home run representing one of his three hits, and Trout hit .229/.317/.229 without a homer. For eight of the 10 stretches, it’s Harper dragging the pair down, with a wRC+ below 70; that conforms to the general impression that he’s the more slump-prone player of the two. One could certainly look at the matter in other ways, using larger sample sizes — going by 15-game stretches with the same methodology, for example, or simply by our monthly splits, or even full seasons. On that last front, 2015 gets the nod on the basis of combined wRC+ (184) or WAR (18.6) if we’re bringing defense into this. By the monthly splits, the pair’s combined wRC+ of 243 for March and April (which we customarily lump together, as we do for September and October) would rank first, but with an asterisk, as it’s the only month besides April 2012 for which the pair has combined for fewer than 100 PA. Discarding what would be the second-ranked month (June 2014) on the grounds that Harper had just four PA, the best combined month for the pair is July 2015, when Trout (260) and Harper (172) combined for a 214 wRC+ in 193 PA. Incidentally, by this method the pair has combined for a 120 wRC+ or better in every month for which we have a meaningful sample from both save for July 2016, when Trout (144) and Harper (65) combined for a 104 mark. Still, I do like the immediacy of the 10-game sample and the fact that it places what we’ve witnessed so far this season near the top of the heap. If Trout doesn’t miss too much time, there’s a chance we can see that number climb. All of which serves to remind us that while major league baseball has problems on and off the field that shouldn’t be ignored, the level of talent today is astounding, and anytime Trout and Harper are both firing on all cylinders is a great time to be watching. We hoped you liked reading Their Powers Combined: Finding the Best of Trout and Harper by Jay Jaffe! Does MLB’s Involvement in Salary Arbitration Cross a Line? When you consolidate down to the top 10 (no overlap), shouldn’t the current streak be fifth? The current streak inexplicably leap-frogs 7/20/15 and 9/23/15. Cool analysis, though! Thank you! It actually seems like the calculated Combined wRC+ for those two streaks might be off – especially 7/20/15, where Trout’s 274.7 and Harper’s 149.5 combine for a wRC+ of 261.4. But yeah, very interesting article! It’s cool to know that we are seeing both of these players at something close to their peaks simultaneously. Crap it appears that I need to re-sort that table. Whoooooooops.